I think I lead a simple life, full of common beliefs, goals, dreams, and aspirations, including the trials and errors and challenges associated with driving. CHEP is a "Commonwealth Handling Equipment Pool" company that manufactures and supplies through either rental or lease agreements pallets for the retail supply chains, like Walmart, Target, U.S. Foods, Sysco, and McLane, to name a few. As for scaling the load, I'd like to know each company's policy for scaling a load (i.e., is there a certain weight a load needs to reach before it becomes a requirement for the driver to scale it?). This case interests me, because it could change the way Trucking Companies advertise in the future. In a classic bait and switch fraud beginning with the Drivers’ recruitment into ENGLAND truck driving school and afterwards, the Defendants subject the Drivers to a variety of fraudulent acts and manipulative techniques to convince them to purchase the Driving Opportunity instead of seeking the “guaranteed job” that Defendants offered and advertised. When prospective Drivers resisted purchasing the Driving Opportunity and insisted on remaining as an ENGLAND employee as promised in many documents and places, including without limitation the Student Training Agreement signed by each enrollee (including the Plaintiffs), Defendants ultimately told them either that they must purchase the Driving Opportunity for at least six months before they will be considered for employment or that they must wait an indefinite period for a truck to become available. Because of Defendants’ conduct, the vast majority of all persons completing Defendants’ truck driving school purchased the Driving Opportunity, consistent with Defendants’ never-disclosed but deliberately established and internally-promoted [the] goal of having at least 65% of the graduates of the driving schools purchase the Driving Opportunity. Being the shrewd business model that is, CR England "recruited" drivers who thought they would have a "guaranteed" job at the end of their training, with costs ranging from $1,995 in cash to $2,995 in credit. Then, when those drivers finished their training, CR England told them they had a job if they purchased a driving opportunity. Seems innocent enough to me, but not to those who relied on CR England's promotion of a guaranteed job only to find out they were the victims of a serious bait and switch program. The law is what the law is, regardless of how "unfair" it may seem to some drivers. As for myself, I am responsible for properly planning my trips to prevent poor performance and tickets. So, should I get a ticket for being overweight from a law enforcement officer in Erie, Colorado, I would have only myself to blame for said ticket. I don't agree with the amount of the overweight ticket, but I do endorse the issuance of said tickets, simply because they are just and the drivers who either got them or will get them didn't exercise prior planning properly. As drivers, we are responsible for planning and, for the most part, routing our own trips, right? Daniel from California has an interesting (to me) account of successfully leasing with Prime and leaving that arrangement to happily pulling dual tankers. Prime has cool video tutorials on our phone app for stuff like that. Several present and past Swift Drivers have posted some cool videos on YouTube, as well. 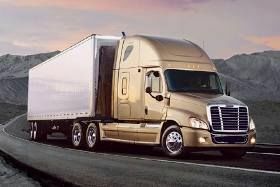 Additionally, Swift provides its drivers access to Swift University AND the "Shop" personnel who are available to answer any questions drivers may have about Swift's refrigerated trailers. I wish I knew the name of Prime's "competitors." No more than 11 hours of driving in a 24 hr period. I am so disappointed that none of the good trucking companies hire CDL trainees in WV. In my humble opinion, the quality of the training Dan E receives is based solely on the quality of the trainer... regardless of whether a Company is considered "good" or "bad." Good luck to you, Dan E. I hope you find what you seek in this industry. My company has a mixture of Peterbilts and Freightliners that drivers use as daycabs on the LTL runs. On those LTL runs, some drivers have 520 mile assignments with little or no downtime at the shippers and receivers while other drivers have 200 to 300 mile assignments with extreme amounts of downtime at both the shippers and at the receivers who use a Just In Time Inventory System. So, I guess the answer to your questions depends on either equipment, miles, or both. Patience is always your friend, and 61MPH is a wonderfully stress-free speed on the interstates at times. From someone with only eight months of solo OTR experience, try to avoid running on recaps, because your "Available Time" and your "Driving Time" decrease simultaneously when the "Total Available Time" reaches 11 hours or less. Plus, the three hours available between 14 and 11 is gone, meaning every time one stops for the mandatory 30 minute break and "other" business, the "Time Available to Work" continues its countdown and there's nothing we can do to stop it. Here is a real life example to help explain my statement. I had an assignment to drive 555 miles from a shipper in South Bend, IN to a receiver in Harrisburg, PA. I had 9.5 hours TOTAL left on my clock to begin my day at the Shipper's dock. After a five minute loading and pre-trip exercise, I had nine hours and 25 minutes left to drive. However, I had to take a 30 minute break somewhere in next seven hours and 55 minutes, leaving me with only eight hours and 55 minutes to drive 555 miles. I average 61 miles per hour. So, I could only drive 543.9 miles that day (legally), leaving me 11.1 miles short of my destination, save for one major problem: I needed to stop once or twice for other affairs. In the end, I would up falling 30 miles short of my destination that day, and I had to start my next day a bit earlier than necessary. Plus, I was still running on recaps, so my TOTAL TIME AVAILABLE TO WORK kept ticking away while I was unloading and, then, reloading the next day. That's why I prefer one of two alternatives: (1) Average 8.75 hours of work every day, and never run out of hours or (2) run as hard as possible to use up the 70 as quickly as possible and take a 34 hour reset. Good luck out there, and Stay Safe! It's snowing in the PNW already. I understand your position about not wanting to sleep for the fear of possibly missing the QC and/or the phone call with an assignment. I was that way, too; for about six months. I continue to get a bit anxious when I don't have a pre-plan. However, I no longer lose valuable sleep over it, because I know my Fleet Manager can see my logs and, if I'm in the bunk, I don't get those message. If I do happen to miss the message, I can read it when I awaken. Melton truck lines going full auto? Having driven both, I am a fan of an automatic transmission, if anything, for safety reasons. Your attention is freed from shifting to being on the road. I do agree with the safety they bring when it comes to being attentive I have driven then both as well. My only pet peave with the autos is when I'm backing into a tight spot and I barely tap the gas and it takes off and I slam in the breaks like a mad man lol this has happened in mostly Cascadias but they ride very smooth! I prefer a manual, lthe manual in my opinion is just awesome ... Unless your in traffic lol. Thanks for the input guys! That kept happening to me until I learned to put an egg between my foot and the accelerator, became a bit more patient, quit relying on the idle to push me back, and I read the Operator's Manual... In short, I hit docks the way they are not suppose to be hit until I learned how to drive the automatic in reverse. Hauling beer can be extremely rewarding, but it can also be extremely challenging. The challenges occur when the beer isn't loaded correctly in the trailer, and either the drive axles, the tandems, or both, wind up with a variance that sends the driver back to the loading dock. That happens quite frequently at Bud in Columbus, Ohio... I spent an entire 10 hour break there trying to get my total weight under 80,0001, and my axles at 34, 000. In the end, I wound up with 12,000, 34,000, and 34,000! As a sidenote, the robots in use there unload and load trailers faster than I ever thought possible. 54 years of safe, accident-free driving! When you see as much stupidity out there as we do every day, even one year is remarkable. What these guys have done goes way beyond that. And then there's the unexpected... One case in point happened a few months ago on U.S. 35 northwest of Chilocothe, Ohio. I was following another driver on an arrow-straight portion of the four lane when, for no reason whatsoever and completely unexpected, the driver made a casual right turn, directly into the unplanted corn field to our right. How does one drive and not pay attention to what is ahead? I've heard texting while driving is one possibility. Talking on the phone while driving is another. Would more permissive split-sleeper-period rules allow drivers to get better rest? I was told not to use the 8/2 split but I don't get penelized if I do use it. I have used it a few times and I'll actually be using it tomorrow. I only use it for a day or 2 because I find it more tiring than a regular 10 hr break. But it does work pretty good for making up for sitting at a dock. I use the 8/2 frequently, because it is quite beneficial. However, I have found that taking the 2 hour break before the 8 hour sleeper berth period works best for me. Also, I agree with everything Brett wrote about the break periods we took before the "Pencil Pushers" decided we needed to turn into robots and work 14 hours per day after taking a "continuous" 10 hours off. I liked the old system. I agree unconditionally with Mountaingirl!!! There are times during the day that I know I will benefit from a three or four hour nap. But, that "nap time" will basically end my 14 hours. So, I take a cat nap and wake up feeling worse than when I stopped. So, I become completely unproductive. On the flip side of the HOS Requirements, I have tried modifying my "split sleeper berth" times, and I have found that, sometimes, working four, five, or six hours and sleeping three or four hours afterwards actually leaves me feeling refreshed. We are all adults out here, and I must say that I support the move toward modifying the HOS rules. He said one big problem he had when driving was arriving at a shipper and then having to wait forever to get unloaded. After having to wait so long, this person said his driving time for the day was up but the shipper still told him he had to leave. If there is no activity in the trailer two hours after the scheduled appointment, I would inquire about it with either the shipper or the receiver and, then, notify my Driver Manager. Doing this seems to help prevent those days when it would otherwise be possible to burn through an entire 14 hour day. Something to note though - HazMat's have to be renewed every 4 years - most license 6-8 years. The BG clearance should be good for the 4 years the HM is. I recently earned my Hazmat by studying the High Road like crazy and supplementing that study with a review of Pennsylvania's CDL Manual. When I finally passed the test, as well as the background investigation, I learned that my Hazmat would be good for the duration of my driver's license - two years! Then, when I renew my license in 2018, everything will be in Synch: My driver's license, background investigation, and Hazmat endorsement will be good for four years. In States where licenses are good for longer periods, being in synch will happen every time the anniversary date of the license renewal falls on the renewal date for the Hazmat. But, Karen, don't let that be a deterrent for obtaining your Hazmat! Go for it! PS - I love the bulldog mascot. I want a Mack just for that reason alone. Start looking for driving jobs in the construction industry, then: That's where you'll find those beasts of burdens! I drove one of those trucks when U.S. Steel was thriving during the 1970's in Pittsburgh, Pennsylvania. After that, I moved into one of their "finer" machines hauling steel for Aero Trucking out of Murrysville, Pennsylvania. I can't say my experience was fond with a Mack, but I did have a love-hate relationship with it; simply because it was so darned dependable :-) Today's Macks are generations ahead of the former ones, but they still retain that same durability quality. Just don't ask why some drivers turn the dog around and have its face looking at them instead of the road in front of the driver. I hope to see you driving a Mack someday, Miss Myoshi.